Heat oven to 425°F. Spray cookie sheet with nonstick cooking spray. Unroll dough; place on sprayed cookie sheet. Starting at center, press out dough with hands to form 12x8-inch rectangle. In small bowl, combine oil, basil, rosemary and garlic; mix well. Brush over dough; sprinkle with salt. Chop tomato; place in shallow bowl. With back of spoon, crush tomato. 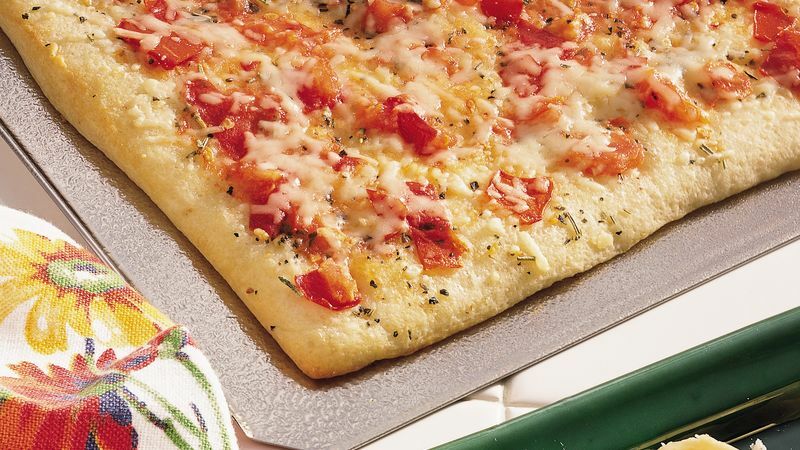 Spread tomato over dough. Bake at 425°F. for 5 to 9 minutes or until edges are light golden brown. Remove from oven. Sprinkle with cheese. Return to oven; bake an additional 2 to 3 minutes or until cheese is melted and edges are golden brown. Cut into squares. Serve warm.